UNIGE researchers have developed a new technology that can bore a hole in the clouds to pave the way for laser-transmitted data from a satellite. We live in an age of long-range information, transmitted either by underground optical fibre or by radio frequency from satellites. But the throughput today is so great that radio frequency is no longer enough in itself. Research is turning towards the use of lasers which, although technically complex, have several advantages, especially when it comes to security. However, this new technology – currently in the testing phase – faces a major problem: clouds. Due to their density, clouds stop the laser beams and scramble the transfer of information. Researchers at the University of Geneva (UNIGE), Switzerland, have devised an ultra-hot laser that creates a temporary hole in the cloud, which lets the laser beam containing the information pass through. It is a world first that you can read all about in the journal Optica. But there is a problem: the laser beams cannot penetrate clouds and fog. So, if the weather is bad, it is impossible to transmit information using lasers. 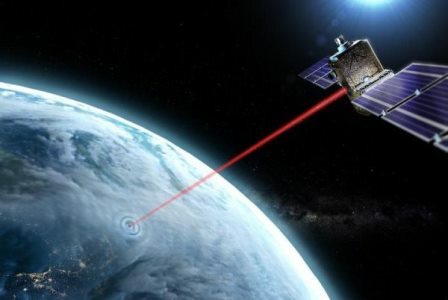 To counter this difficulty, current research is building more and more ground stations capable of receiving the laser signals in various parts of the world. The idea is to choose the station targeted by the satellite according to the weather. Although this solution is already operational, it is still dependent on weather conditions. It also creates certain problems regarding the settings on the satellite, which have to be processed upstream of the communication, without any assurance that there will not be any cloud cover at the appointed time. This “laser cleaner” is currently being tested on artificial clouds that are 50 cm thick but that contain 10,000 times more water per cm3 than a natural cloud – and it works, even if the cloud is moving. “Our experiments mean we can test an opacity that is similar to natural clouds. Now it’s going to be about doing it on thicker clouds up to one kilometre thick,” continues Wolf. “It’s also about testing different types of clouds in terms of their density and altitude,” adds Schimmel. This new technology represents an important step towards the commercial use of satellite laser communication. “We’re talking about possible global implementation by 2025, and our idea is to be ready and to allow countries that are overcast to have this technology!” concludes Professor Wolf.